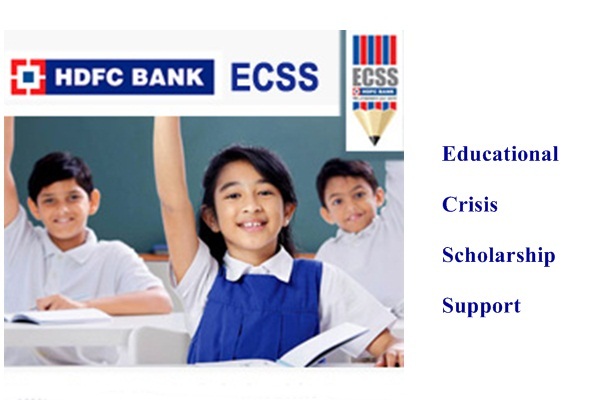 HDFC Bank is offering Educational Crisis Scholarship Support (ECSS) programme for Indian students. Educational Crisis Scholarship Support programme is envisaged to provide interim support for children facing a personal/economic exigency. ECSS aims to cover students from recognized Private or Government aided schools between standards 6 and 12 and students studying in undergraduate and post-graduate courses (full-time/part-time degree/diploma/ courses) who are unable to continue bearing the cost of education and are at risk of dropping out of school/college/university. This situation would be defined as bereavement/ death/ terminal illness/ permanent disability and loss of job of the breadwinner due to accident or any such extreme circumstances that have put a strain on the family resources. The Scholarship is renewable for a maximum of two years only. The students is required to re-apply and requalify each year. The scholarship is non-transferable. In such cases the scholarship will be cancelled and the student will have to re-apply. The Scholarship will cover the total annual School Fee upto a maximum of Rs.10,000/- and College/ University Fee upto a maximum of Rs.25,000/- of the selected candidates. The scholarship is awarded to study all the subjects. Students can apply either online or submit physical copy application forms. Physical copies can be submitted at any HDFC Bank branch. Ensure that the form is complete along with the necessary attachments. Incomplete forms will be rejected. Students submitting online application are NOT required sending hard copy of same. Economic difficulties in itself will not qualify as a crisis unless the same is due to the occurrence of a sudden incident such as loss of job/death/separation of parents or any such unfortunate situation. A 'CRISIS' situation is defined as a sudden occurrence of an incident that has created a situation where the student/family requires support. The incident leading to a crisis should be within the preceding two years. Please clearly mention details of the situation in the relevant sections to enable better understanding of the need. Ensure that the contact numbers of both the student and the educational institute are valid as a verification call will be made to these numbers. Inability to respond to the verification call may lead to rejection of the application. Students will be selected basis the score that they receive on the selection parameters. While every effort will be made to ensure a fair screening, the management reserves the right to decide the final recipients.